Dr. Andrews loves GALILEOS because it helps her make a diagnosis quickly, easily and accurately. Simply put, 3-D scans capture much more data than traditional X-rays. This gives Dr. Andrews an in-depth picture of your jaw, mouth and teeth. This information is used to determine whether certain problems such as cavities, abnormal growths, sinus problems, sleep apnea or nerve damage exist -- conditions that aren't evident from a traditional 2-D image. One of the best things about the GALILEOS 3-D imaging system is how comfortable it is for patients and how quickly it delivers comprehensive information to Dr. Andrews. According to Michael Augins, president of Sirona, you will need to stand still for about 14 seconds while GALILEOS travels around your head and takes about 200 images. That's it! The computers then take about 2-3 minutes to reconstruct the data in order to provide Dr. Andrews with high-resolution images. 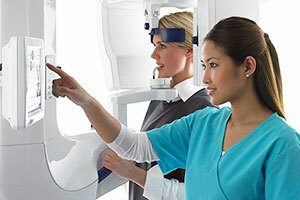 If you've ever had a panoramic X-ray done, your experience with GALILEOS won't be much different.